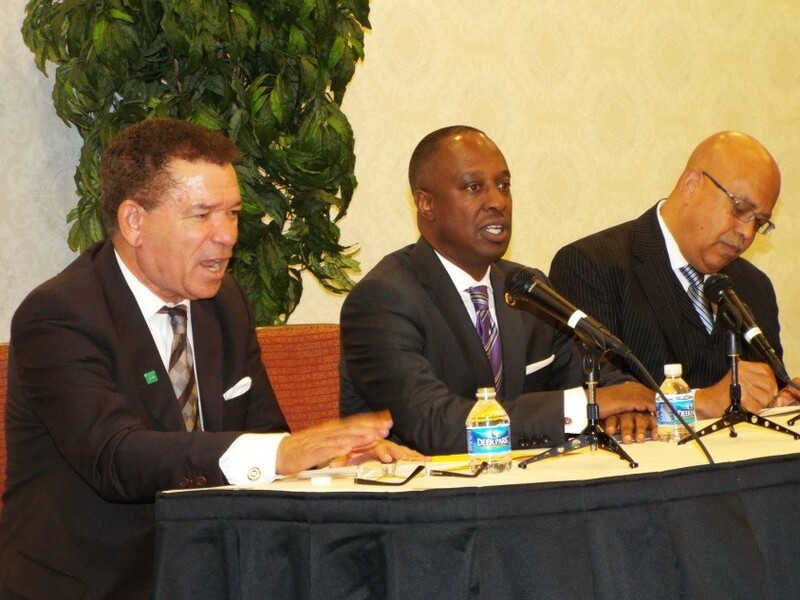 discuss a new plan for economic development through the Black Church. (TriceEdneyWire.com) – When Dr. Martin Luther King Jr. was assassinated, he and other protestors had won passage of the Civil Rights Act of 1964 and the Voting Rights Act of 1965. Therefore, his agenda had turned toward the next major issue - economic empowerment for Black people. Therefore, on April 3, 1968, planning a march on behalf of oppressed sanitation workers, Dr. King told preachers at the Mason Temple in Memphis, Tenn., “It's all right to talk about long white robes over yonder, in all of its symbolism. But ultimately people want some suits and dresses and shoes to wear down here! “It's all right to talk about streets flowing with milk and honey, but God has commanded us to be concerned about the slums down here, and his children who can't eat three square meals a day. The next day, Dr. King was assassinated. Grant was keynote speaker during a special session on “Economic Development through the Black Church” during the A.M.E. Church’s 2nd District Mid-year Opening Plenary Session in Raleigh, N.C. late last year. His speech preceded a panel discussion that also included Marie Johns, former deputy administrator at the Small Business Administration; Ron Busby, president/CEO of the U. S. Black Chambers Inc. and Rev. Jonathan Weaver, senior pastor of Greater Mt. Nebo A.M.E. Church in Bowie, Md., and board member of the A.M.E. organization that deals with economic growth and development projects. Following the forum, Weaver says A.M.E. pastors, led by Bishop William P. DeVeaux, are now poised to carry out a specific plan that they hope will spread to other denominations and ultimately catch fire in other denominations and the Black community throughout 2015. The starting plan, in a nutshell, is for churches located in the A.M.E. Second District - North Carolina, Virginia, Maryland and D.C. – to commit to the support of two Black-owned businesses. They are Thomas Morehead, president of a BMW dealership in Sterling, Va. and Donnell Thompson, co-founder/co-owner of RWDT Foods, Inc., a chain of restautrants based in N. Snellville, Ga.
AME church members buying from those two businesses will cause the churches to benefit from those sales; then identify other businesses in and around the states and “replicate this process”, Weaver described. After tracking the sales, initiated by the churches, the hope is that other church districts will get involved and that the movement will spread to other businesses and other churches. In his speech, Grant reminded the audience that a legacy of Black economic develop was at the core of the founding of the A.M.E. Church. There are currently 1.9 million Black-owned businesses in America, but only about one in 20 have more than one employee and less than 2 percent have annual gross receipts of more than $1,000,000. In terms of relative wealth, White America is 20 times richer than Black America, according to a recent Pew Report. In the 1960’s, we had 60 Black-owned banks. Today, that number has dwindled to only 30. What is insane about this tragic loss is this: The bank is the only institution in our community that can leverage or multiply dollars 7, 8, 9 or 10 times. That means for every $1,000,000 dollars of invested capital in these banks, they are able to loan out 7, 8, 9 or $10 million for economic development, business growth and job creation. 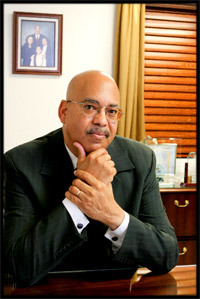 Grant said African-Americans lost significant ground in business ownership after integration, largely because African-Americans were no longer forced to support each other.